I hope it keeps getting updated. It could be useful. I agree. I'm going to try and document some things that I think PeopleBooks doesn't go into enough detail about. How do we get access to add content. I've got a useful tip on adding a pause to PeopleCode that I have searched for multiple times on the web and just found a solution I'd like to add here. 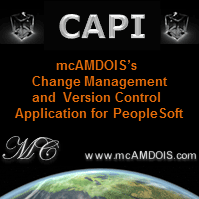 Please see the article on contributing to the PeopleSoft Wiki for details.